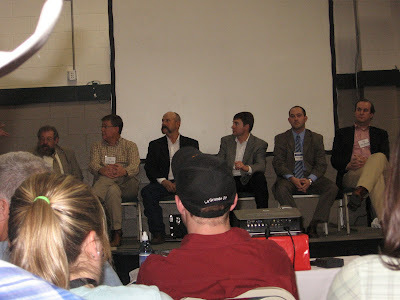 "Opportunities in a Changing Beef Industry"
This was the sixth year that this workshop has been presented, but the first time Clint and I had been able to go. It was an awesome day. The agenda was packed with presentations that were current and really thought provoking. With over 400 people in attendance, we had to stand the first half because the facility ran out of chairs. RFD-TV filmed the sessions, so if you missed it, you'll be able to catch parts of the presentations on TV! Oh, and we got to see Sweet Blessing's Mr. (aka Pat) there too! Which, Clint graduated from CSU so it was great to catch up with (him) and meet (me) old friends, professors and classmates. This workshop was titled "Opportunities in a Changing Beef Industry". This workshop made me think - about myself, how I represent the beef industry, how I help the beef industry, and what I can do better personally to contribute to how ag is viewed by the public and how I can contribute to it's success in the future. A lot of information was presented and discussed during the workshop. Too much to ever cover in a blog post - and I've probably already crammed too much into THIS post - but oh well. - On NCBA's website, you can click on the "Call to Action" link and after entering your zipcode, NCBA will send a pre-written letter to your congressman from you thanking them, or encouraging them to take action on a bill/item that is important to you? How sweet is that - they do all of the work for you! - If you've been following Prop 2 in California (and it's impact in other states) you know that it's been a significant concern for many in agriculture. But did you also know that HSUS didn't touch the beef industry with their legislation? And do you know why? I didn't - but I should have. The opinion Saturday was because even though HSUS's goal is to eliminate animal agriculture in America....they view the beef industry better than other animal industries. When compared to all of animal agriculture - we're the good guys in their eyes. Right or wrong (I'm hesitant to throw other animal ag industries under the bus) - that stopped HSUS from adding constraints to Prop 2. - Dr. Rollin (who often works with HSUS and ag groups to reach concensus) had some really tough and provoking challenges for us last Saturday - if you've heard him speak, you'll know he's funny, not politically correct, cuts to the chase, tells you how it is....but is fair. 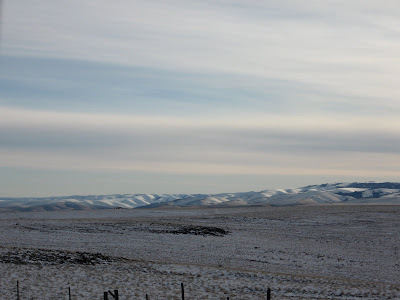 Everything he said Saturday was fair - even his comments about how ranchers need to find an alternative for branding and castration was logical - maybe not widely accepted by everyone - but fair. - The US cowherd is at an all time low. Beef exports are low - but opportunities for growth are there. NCBA is facing a major restructuring. Ranching is a tough business to break into - but the opportunity is ahead of us. Frankly, it's staring us right in the face. You made Saturday great - not only for me, but for the many others that were there. Hopefully, as each of us headed our way home (through more snow!) we took away your thoughts and challenges for the future. Because there IS opportunity in this changing beef industry....the question is, will we seize it? Thanks for your commitment to all that you do and say! You're definitely a woman that gives everything her all! Ranching is difficult to break into especially with the price of land these days. Arming yourself with information and conferences like the one you attended keep you informed and that helps in all areas of the business. Thank YOU for sharing...of course I always get bits & pieces from my Mr...but, it was great getting a female perspective! The best part was Pat always comes home recharged, feeling proud of what he is striving for, and so encouraged! So wish I could of gone too :D And, THANK YOU for truly making a difference in the beef industry through ALL you do! Sweet blessings!